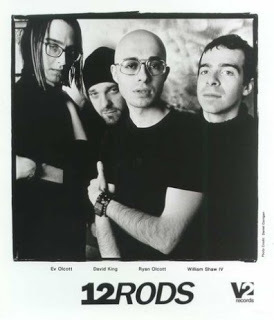 The post-new wave unit 12RODS was formed in Ohio in mid-1992; originally dubbed Ryan's Bihg Hed in honor of frontman Ryan Olcott, the group eventually settled on a permanent name as well as a permanent line-up with the additions of synth player/guitarist Ev and drummer Christopher McGuire. An early demo helped land 12RODS a recording date in Minneapolis, resulting in the release of their full-length debut, Bliss. A 1996 EP, Gay?, brought the trio the attention of the V2 label, who soon made 12RODS their first American signing; the group's major-label debut Split Personalities was released in 1998. The Todd Rundgren-produced follow-up, Separation Anxieties, appeared in the summer of 2000.